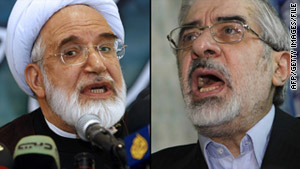 Mehdi Karrubi and Mir Hossein Moussavi and their wives have not been arrested, government sources say. (CNN) -- Iranian opposition leaders Mir Hossein Moussavi and Mehdi Karrubi and their wives were placed in a "safe house" for their own welfare, but they have not been arrested, Iranian government sources told CNN Saturday. "The opposition movement is very much looking for martyrs so if this is true it's for their own safety," one source told CNN. The pro-reform opposition movement "is always looking for an excuse to create something, so this may be done to keep someone from doing something to them," the source added. "Moussavi and Karrubi and their wives have been disappeared; they are being held incommunicado in an unknown location, a severe breach of Iranian and international law," Aaron Rhodes, a spokesman for the campaign, said in a statement. "Given the lynch mob-like calls for their execution by numerous Iranian politicians and clerics, there is reason to be deeply concerned for their safety and well-being," Rhodes said. State-run Press TV aired video of Iranian lawmakers earlier this month chanting, "Moussavi, Karrubi ... execute them." The human rights organization also pointed out that "a 'safe house' is considered a place for the secret detention of high security-value detainees, which is not under the control of the judiciary or any other monitoring mechanisms. The Revolutionary Guards and Iranian intelligence agencies are well-known for using safe houses for all methods and techniques to get confessions from detainees without scrutiny or pressure from other legal bodies." "Given the use of so-called safe houses to mistreat opponents of the government in the past, the campaign finds it deeply disturbing that Moussavi and Karrubi have reportedly been removed to such a facility," the statement said. Iranian authorities began rounding up many government opponents this month amid calls for protests like those that have swept across North Africa and the Middle East. Iranian leaders have praised the revolution that overthrew Egyptian President Hosni Mubarak, but when protesters in Iran took to the streets of Tehran on February 14, the government cracked down hard. The Iranian government rounded up activists ahead of the protests after Karrubi and Moussavi called for supporters to gather at Azadi Square -- the site of mass protests by Iran's opposition movement after the disputed 2009 presidential elections. Despite the security crackdown, tens of thousands of demonstrators marched in Tehran. Dozens of demonstrators were detained during those protests, while videos posted on YouTube showed others had been chased and beaten. The Iranian government source claimed Saturday that Iranians are disturbed by the opposition's demonstrations. "The people are not happy with these protests and these people (Moussavi and Karrubi) making announcements for more protests. The people believe their peace is being disrupted and they want these protests to stop," the source said. U.S. Secretary of State Hillary Clinton on Wednesday accused Iran of a repressive crackdown on protesters and political opponents in the past 10 days, including the killing of peaceful demonstrators by security forces. International journalists have been limited in their ability to gather news in Iran, where the government has cracked down on the media and maintains tight control of state-run news organizations. During the protests earlier this month, foreign journalists were denied visas, accredited journalists living in the country were restricted from covering the demonstrations, and internet speed slowed to a crawl in an apparent attempt to restrict information from being transmitted out of the country.